This article shows how to use TranslateTransitions, FadeTransitions, Timelines and Timeline chaining to implement a simple lottery wheel where names rotate around a point. The wheel reduces its speed continuously and at the end the winner name is highlighted. 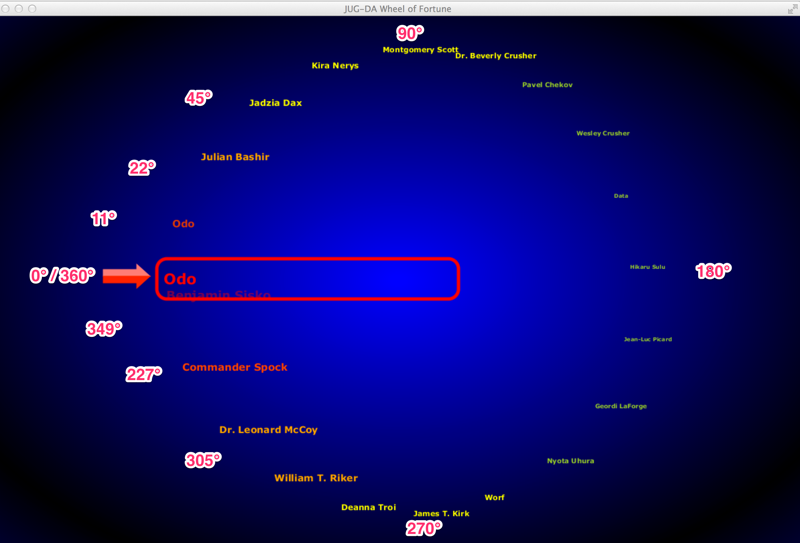 The names are loaded from a simple text file and positioned around the middle point. The winner is indicated by an arrow which is created with a Path. The Font size and the Color of the names depends on the angle where they are placed around the circle. Hint: The source code is available at GitHub. The link is at the end of the text. The following screenshot shows the lottery wheel and the angles I used to position the names. The angle with the degree 0 is on the left hand side where the arrow and the rectangle is placed. Keep in mind that normally this is the angle with 270 degrees. The angles are rotated by 270 degrees clockwise. The following code calculates the points where the names should be positioned around the center. Important is the startAngleDegree because the rotation should start at an angle of 270 degrees. First you have to divide 360 degrees by the number of names to determine the rotation angle. E.g. if you have 36 names every name is rotated by 10 degrees. So it is possible that the distance between the names are equal. If you want to use sine (Math.sin()) and cosine (Math.cos()) you have to calculate the radian value of the degree value. This done by multiplying the angle with Math.PI / 180. All calculated points and degrees are stored in a List of Points. To store the points a simple data structure Point is used. Nothing special. No getters or setters. Every timeline animation is repeated for cyclesPerTimeline (e.g. 5). In this example 10 timeslines are created. For every timeline a duration in milliseconds is defined. Because the lottery wheel should slow down, the duration each timeline needs increases. In line 10 the method createTimeline is called. Important is the parameter nextTimeline. This is the timeline which will be started when the previous timeline has finished. This functionality is realized with the method setOnFinished in line 13 below (highlighted). The transitions to move the names from one position to the next are part of the method moveNames. Important is that the position of the name is stored in the userData of the Text object. This value is used to deternine the next Point. For every name object a TranslateTransition is used to move the text from the actual point (including the translations used before) to the next point. The method handleNextTimelineAndWinner calls the next timeline, if there is one. Otherwise it was the last timeline in the chain and the winner can be displayed. We have to make the winnerName visible with a FadeTransition. Remove the arrowText, switch the styling and position the text. The method formatText is used to format the names which rotate around the center. Depending on the angle the Text changes its color and size. If you recall the screenshot with the angles above the point.angle used in the if-statements in the following method are more comprehensible. Yes, the variable angle with the degree angle could be replace by radian degrees, but this solution is better to maintain. The following method draws the arrow with a Path. First the top of the arrow is drawn and second the bottom of it. The colors are defined in the css files and the styleClass arrowStyleUp and arrowStyleDown is used. Keep in mind that this solution is not very maintainable. A better way to draw such objects is using an external vector drawing program (e.g. InkScape) and export the coordinates. These coordinates can be used as input for the Path. The start method puts all things together and draws the Rectangle with the rounded edges. // Calculate all points where the names should be positioned.